Heat Seal Paper is the Cadillac of food service paper. 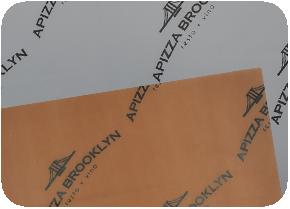 This one of a kind heat seal coating will exceed all your expectations when it comes to flexible food service packaging. 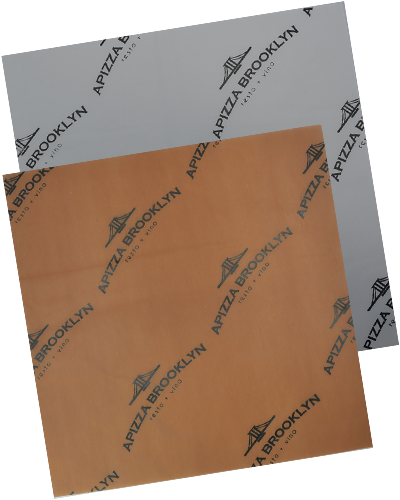 Heat Seal Paper can be used as a standard food wrap, or turned into a custom size bag to fit any food product size. This heat seal paper keeps wrapped food sealed and safe for retail sale. Heat seal food can be packaged and shipped in the same paper without worry of contamination or exposure to outside elements. All you need is a standard heat sealer, and you can begin making custom packaging to fit all your food service needs! This unique food service sheet will take your food packaging capabilities to the next level! What is the minimum order requirement for custom printed Heat Seal Paper? The minimum order requirement for custom printed Heat Seal Paper is 1 case = 2,000 sheets, OR 3 rolls = 3,000 feet (1,000 feet per roll). No need to store lots of paper when you can order in such small quantities. What is the lead time for custom printed Heat Seal Paper orders? Standard lead times for all custom printed Heat Seal Paper orders is 6-8 weeks. Rush orders are available for an additional fee when the production schedule allows. Transit time is typically 2-4 days for the East coast and 5-7 days for the West coast. What size sheets are available for Heat Seal Paper? Heat Seal Paper can be cut to any custom sheet size needed. This is great for making custom bag sizes to fit any size food item. What are your Heat Seal Paper printing capabilities? Heat Seal Paper can be printed with up to 2 spot PMS colors. Sometimes, a screen of either existing PMS color can be made to add the look of a third or fourth color. Our design team will review your art file and determine what colors are able to be printed. We can match any PMS color on the chart. Looking for the next big thing in food service containers? Check out our new line of custom printed Fry Scoop Cups. They are completely customizable and only have a 1,000 piece minimum order requirement.